New X-ray observations show the auroras — northern or southern lights — on Jupiter behave differently at each pole. This makes Jupiter puzzling and unlike Saturn (no known auroras) or Earth (where north and south pole auroras mirror one another). These latest X-ray findings are challenging the current theoretical models that explain the Jovian auroras. Scientists hope to combine Chandra, XMM-Newton, and Juno data to learn more about the source of Jupiter's auroras. Jupiter's intense northern and southern lights, or auroras, behave independently of each other according to a new study using NASA's Chandra X-ray and ESA's XMM-Newton observatories. Using XMM-Newton and Chandra X-ray observations from March 2007 and May and June 2016, a team of researchers produced maps of Jupiter's X-ray emissions and identified an X-ray hot spot at each pole. Each hot spot can cover an area equal to about half the surface of the Earth. The team found that the hot spots had very different characteristics. The X-ray emission at Jupiter's south pole consistently pulsed every 11 minutes, but the X-rays seen from the north pole were erratic, increasing and decreasing in brightness — seemingly independent of the emission from the south pole. This makes Jupiter particularly puzzling. X-ray auroras have never been detected from our Solar System's other gas giants, including Saturn. Jupiter is also unlike Earth, where the auroras on our planet's north and south poles generally mirror each other because the magnetic fields are similar. To understand how Jupiter produces its X-ray auroras, the team of researchers plans to combine new and upcoming X-ray data from Chandra and XMM-Newton with information from NASA's Juno mission, which is currently in orbit around the planet. 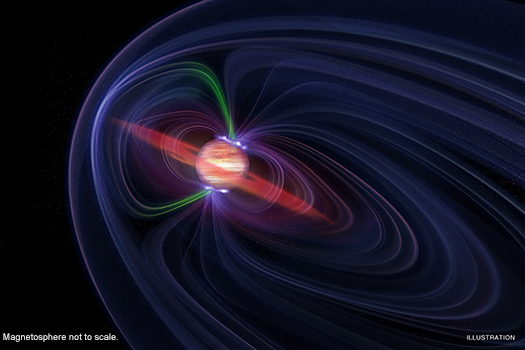 If scientists can connect the X-ray activity with physical changes observed simultaneously with Juno, they may be able to determine the process that generates the Jovian auroras and by association X-ray auroras at other planets. One theory that the X-ray and Juno observations may help to prove or disprove is that Jupiter's X-ray auroras are caused by interactions at the boundary between Jupiter's magnetic field, which is generated by electrical currents in the planet's interior, and the solar wind, a high-speed flow of particles streaming from the Sun. The interactions between the solar wind and Jupiter's magnetic field can cause the latter to vibrate and produce magnetic waves. Charged particles can surf these waves and gain energy. 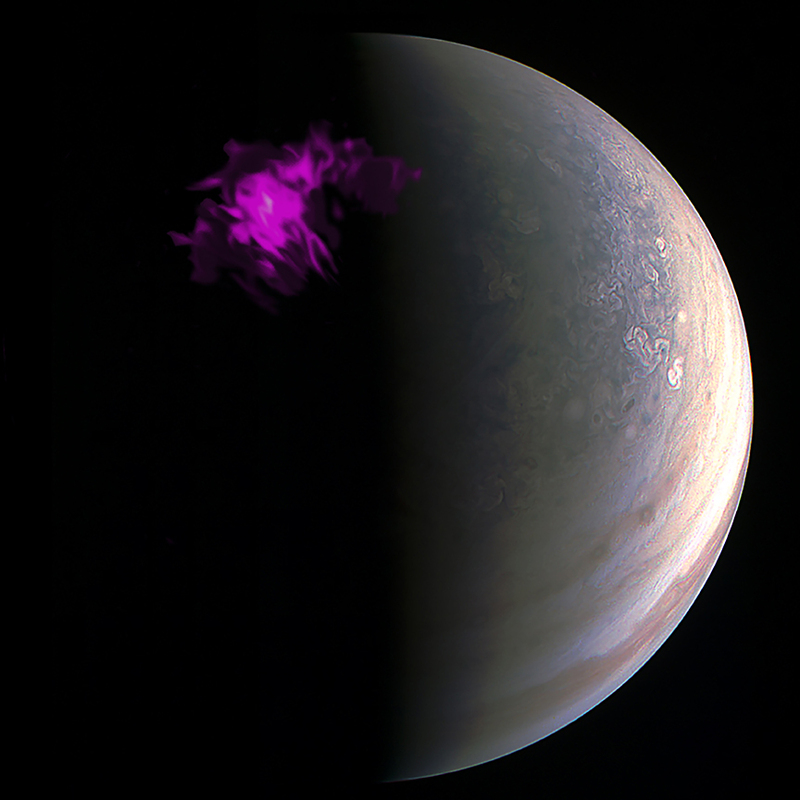 Collisions of these particles with Jupiter's atmosphere produce the bright flashes of X-rays observed by Chandra and XMM. Within this theory the 11-minute interval would represent the time for a wave to travel along one of Jupiter's magnetic field lines. 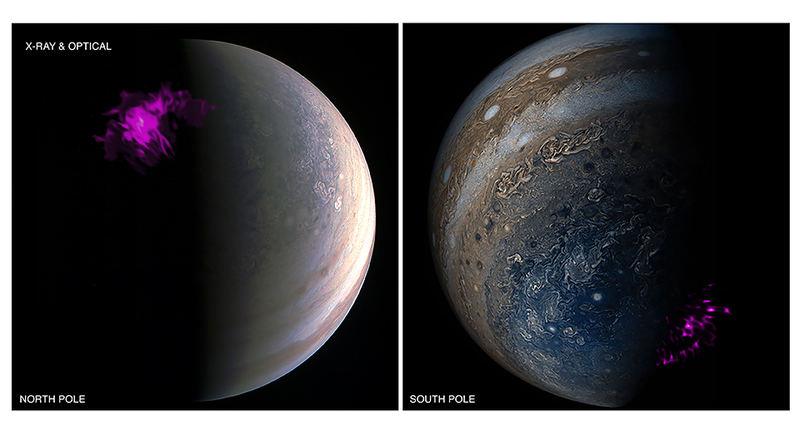 The difference in behavior between the Jovian north and south poles may be caused by the difference in visibility of the two poles. Because the magnetic field of Jupiter is tilted, we are able to see much more of the northern aurora than the southern aurora. Therefore for the north pole we may be able to observe regions where the magnetic field connects to more than one location, with several different travel times, while for the south pole we can only observe regions where the magnetic field connects to one location. This would cause the behavior of the north pole to appear erratic compared to the south pole. A larger question is how does Jupiter give the particles in its magnetosphere (the realm controlled by Jupiter's magnetic field) the huge energies needed to make X-rays? Some of the X-ray emission observed with Chandra can only be produced if Jupiter accelerates oxygen ions to such high energies that when they violently collide with the atmosphere all eight of their electrons are torn off. Scientists hope to determine what impact these particles, which crash into the planet's poles at thousands of kilometers per second, have on the planet itself. Do these high-energy particles affect the Jovian weather and the chemical composition of its atmosphere? Can they explain the anomalously high temperatures found in certain places in Jupiter's atmosphere? These are the questions that Chandra, XMM-Newton, and Juno may be able to help answer in the future. A paper describing these results appeared in the October 30th issue of Nature Astronomy, led by William Dunn of the University College London. NASA's Marshall Space Flight Center in Huntsville, Alabama, manages the Chandra program for NASA's Science Mission Directorate in Washington. The Smithsonian Astrophysical Observatory in Cambridge, Massachusetts, controls Chandra's science and flight operations. I thought scientists have discovered that Jupiter’s auroras were caused by interactions with it’s moon system. Jupiter's northern and southern lights, or auroras. About 793 million km from Earth on date of Chandra observations. Jupiter's diameter is 139,822 km. X-rays are purple, optical is pseudocolor. It is the 5th planet from the Sun in our solar system.